The TMT Project's outreach effort, which began last year, has already had a galvanizing effect on students throughout the state, according to teachers and organizers. Along with support from other sponsoring associations, student robotics in Hawaii is reaching new heights, and looks set to keep expanding and inspiring in the years ahead. Four high schools on Hawaii's big island have received funds from the TMT Project to date – Hilo High School, Kealakehe High School, Kohala High School and Waiakea High School – as well as Earl's Garage, a community-based, science-and-technology extracurricular organization in Waimea. Two big international robotics contests held earlier this year highlight how TMT's support has played a major part in advancing program goals. Three of the four sponsored high schools' teams built robots that qualified for and competed at the FIRST (For Inspiration and Recognition of Science and Technology) World Championship, held in Missouri from April 27 through 30, as well as the VEX Robotics World Championship April 15 and 16 at Disney World in Orlando, Florida. The competitions attracted thousands of students and teachers from all 50 states and dozens of countries. In the main events at this year's contests, alliances of robots squared off to score points by placing objects on racks (FIRST) or in goals (VEX). The robots had to perform autonomously for a brief period at the start of a match, after which humans remotely operated the machines for two minutes of game play. The arenas at each competition, and therefore the sizes of the robots, were on different scales; for FIRST, a large game area measured 54 by 27 feet, while VEX had an emphasis on smaller bots duking it out in a 12 by 12 feet zone. Even though they had never competed at FIRST or VEX before, the Kealakehe rookie RoboRiders roared out of the regional gates to qualify for both international competitions. With financial support from TMT, Kealakehe plans to host a VEX tournament of its own in September in the western part of the Big Island. "With the TMT funds, not only have they definitely improved our school education, but they are helping us branch out into the community," said Justin Brown, robotics coordinator and team coach at Kealakehe. Kohala's team, Na Paniolo ("the Cowboys"), had a great run themselves at this year's VEX championship. The team barely missed making the semifinals after earning the top rank in their division over 104 other teams. For a small school located in a rural part of the Big Island, the robotics team's success has been very rewarding, said program director Fern White. "All of this is really making a difference in my students' lives," White said. The team from Waiakea, named Warrior Pride, placed highly at both major tournaments as well. Before heading to the mainland U.S. for the contests, the school's team won the Engineering Inspiration Award at FIRST during regionals in Oahu, plus the Excellence Award – twice – at two late 2010 VEX tournaments, signifying Waiakea's success and promotion of engineering. "The award is given to teams who demonstrate that their program has had an impact on the community, which ours definitely has," says Dale Olive, robotics coordinator at Waiakea. Waiakea, along with Kohala, also has had the distinction of being the only United States secondary schools so far to participate in the International Micro Robot Maze Contest, the 19th annual event of which was held at Nagoya University in Japan last fall. TMT's funding enabled the Kohala team to go in 2010. "The Japan experience was key to the growth of our team and to our success at the VEX World Championship," said Kohala's White. The Hilo High School Vikings Robotics Club, meanwhile, after a few quiet years is getting back on track. The team competed in regionals in Oahu for both VEX and FIRST, entering the latter competition for the first time in four years. TMT funding is helping shore up the team's finances, and that bodes well for students down the road. "Robotics is about more than simply building some cool piece of technology; it is about developing skills that can be used in every facet of life," says former team president Noa Flaherty, who will attend the Massachusetts Institute of Technology this fall. "We have seen our students transform from being shy into leaders who have superb communication and problem-solving skills." Many other local and regional competitions and workshops have drawn the attention and skill of Hawaiian student robotics teams. Examples include the Botball Educational Robotics Program, the Marine Advanced Technology Education (MATE) Remote Operated Vehicle, Letry robot tournaments and a just-announced August event set up in part by Big Island-based Easybotics, which will teach students how to build and program a bipedal robot. The benefits of TMT's funding of student robotics have not been isolated to the Big Island. Waiakea High School's Robotics Club, for example, has leveraged its TMT sponsorship into receiving a grant from the Friends of Hawaii Robotics to conduct workshops on Oahu, Maui, Kauai and Molokai over this past year. "This spinoff effect from TMT's funding has helped boost a lot of people's interest in robotics statewide," said Art Kimura, program director for Future Flight Hawaii, part of the Hawaii Space Grant Consortium at the University of Hawaii, which aids in outreach efforts. TMT funds have also paid for "BrushBot" kits, which are tiny robots made from a toothbrush head, a miniature motor and batteries. Earl's Garage has been able to expand its robotic program to reach younger kids courtesy of these BrushBots. "The opportunity to expose children to robotics at an earlier age has been fabulous," says Katherine Dubose of Earl's Garage. Parents would seem to agree, given comments sent in via email after a BrushBots FEST (Families Exploring Science Together) held in mid-May at the Imiloa Astronomy Center. One parent described the event as "completely awesome" and others remarked how sons and daughters came away excited, with a parent noting that his or her child "seems to have found a new interest in robotics/space." This sort of inspiration is the ultimate goal of TMT's outreach, and the students' hands-on experience in technical fields will prove valuable down the road. 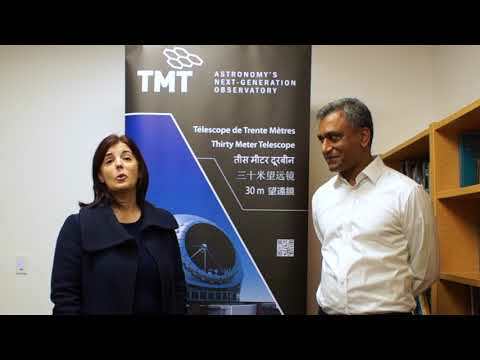 "These robotics competitions are great preparation for people to work in high-tech jobs such as those that the Thirty Meter Telescope will bring to the region," said Sandra Dawson, manager for Hawaii community relations for TMT.